CLIMPAX will develop the world’s first climate impact rating for investment funds. It is a Climate-KIC innovation project led by South Pole Group and CDP Europe. Working together with key financial industry and NGO stakeholders, the two organisations are developing an easy-to-use tool that will support climate conscious decision-making. What is CLIMPAX? 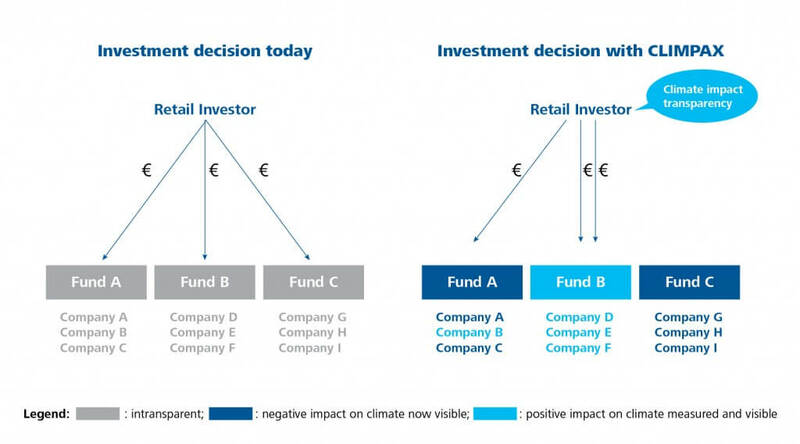 A holistic climate impact assessment of investments. Commitment and policies, including fund managers’ commitment to reducing their climate impact. Why now? It’s a game-changer for climate-friendly investing. Financial markets play a key role in tackling climate change. However, most parts of financial markets lack transparency when it comes to the climate impact of an investment. This is especially true for investment funds, which channel millions of private savings into companies’ stocks and bonds every day. This comes at a time when more and more investors – private and institutional – are concerned about the climate impact of their money and the risk that climate change poses to their savings. At the same time, new investment opportunities from climate change are appearing in which many want to participate, especially since the latest COP in December 2015 in Paris showed the international community will move towards a transition to a low carbon economy. Transparency is key to action. CLIMPAX will for the first time make the climate impact of a fund transparent, allowing any investor to make divestment decisions in the favour of selecting more climate-friendly funds. The project thus aims to provide a transformational level of transparency to a market of over 29,000 mutual investment funds across the European Union. What next? Become involved in CLIMPAX. Who is behind this? A consortium of industry leaders. The project team is made up of leading institutions in the fields of climate change reporting, carbon footprinting and sustainable finance research.